This version of the CTA Heliconair HC-I Convertiplano is the premier version powered by the British Armstrong-Siddeley ASMD.1 Double-Mamba gas turbine engine. IRMA will be producing the HC-Ib with the American Wright R-3350-DA3 18-cylinder radial-piston engine, and the HC-II with the four American General Electric G.E. T-58 gas-turbine engines. The variations are important to note because in both HC-I versions the engines were located behind the cockpit so it will be necessary to close the door with a piece of sheet plastic (provided) and to insert the shaft drive from the rear of the cockpit to the control consol. 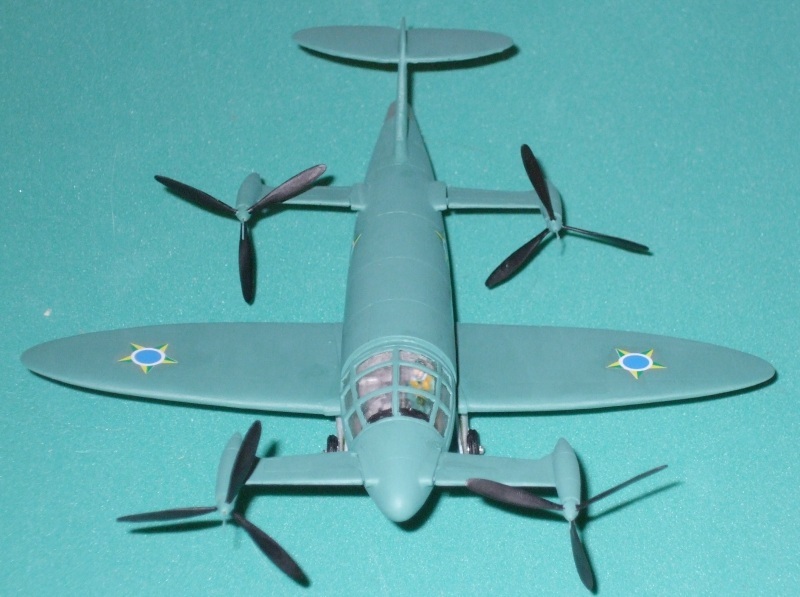 In the HC-II version there was a door from the cockpit to the passenger compartment since the engines were then located on the ends of the lift-wings. Onto the kit! As always, begin by washing solid resin parts in water with mild dish soap to remove release agent. For clear resin place in plain water overnight. Remember too to have all tools and equipment handy including hobby knife, hobby saw, sand paper, sanding cloth, micro-drill, and cyanoacrylate glue and gel and a dust mask. Ok, let’s get started! 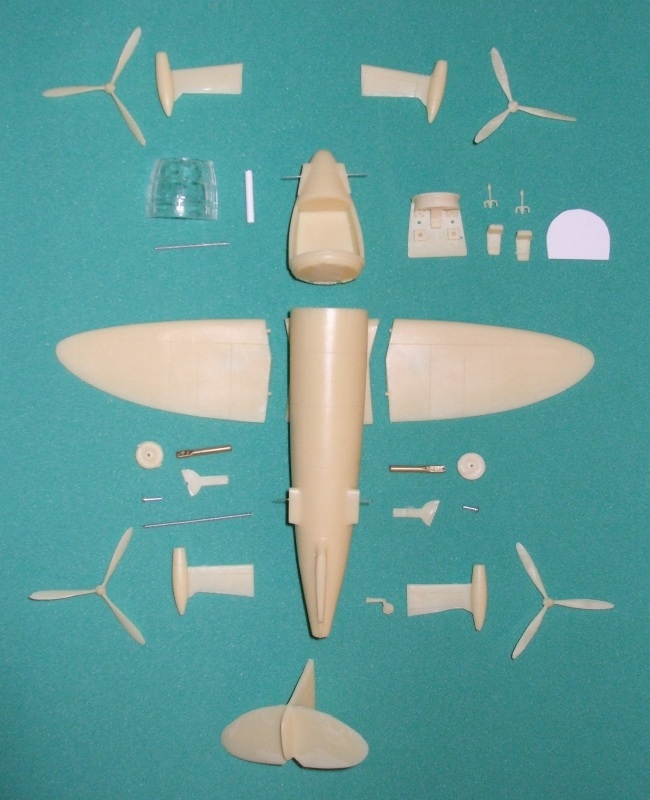 First take a number 1/32" drill and clear out the holes for the adjustor rods for the front and rear lift-wings. Next use the same drill bit to drill out the lift-wings. 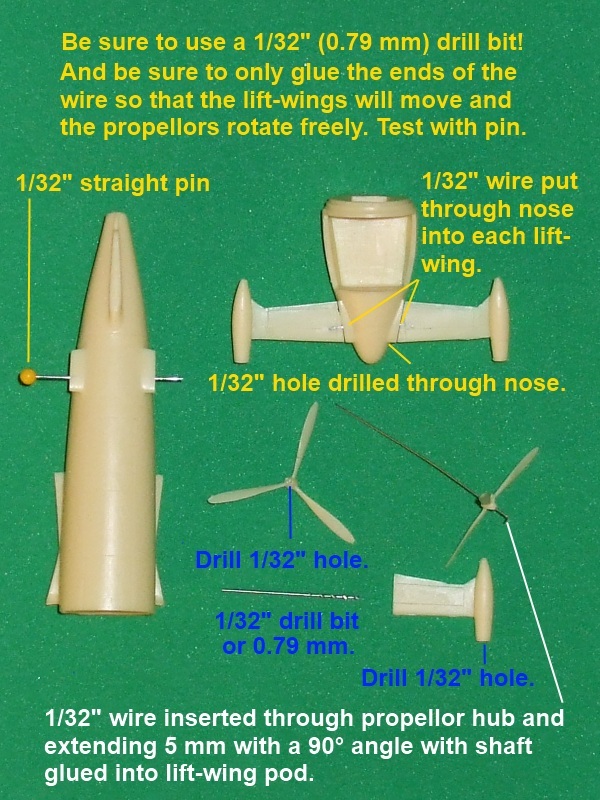 For the propellors, drill out the centers for some 1/32 wire to go through and bend the front at a 90° angle for the front for rotating propellors. Now assembley can begin. Start with the nose section by inserting the longer wire, the adjustor rod, through the drilled out nose hole. Make sure the adjustor rod is about 1/8" (4 mm) on each side. 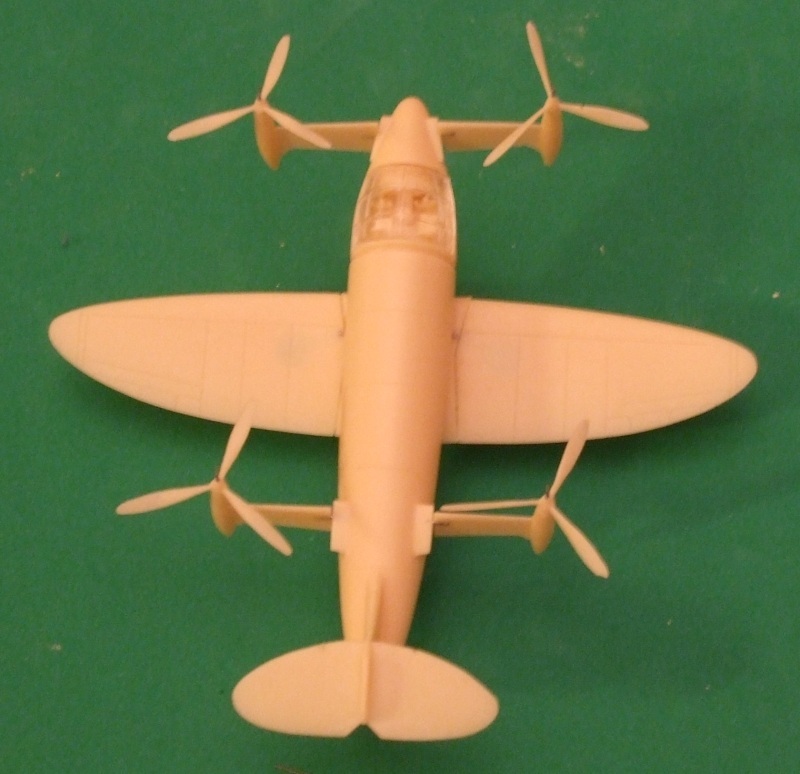 Next, put a drop of superglue on one end and insert either the left or right lift-wing. Next do the same thing and insert into the other lift-wing. Make sure all aspects are lined up so that when dried your lift-wings rotate together. Now take the fuselage and to the same thing. First insert the shorter adjutor rod and make sure 1/8" (4 mm) are present on each side. 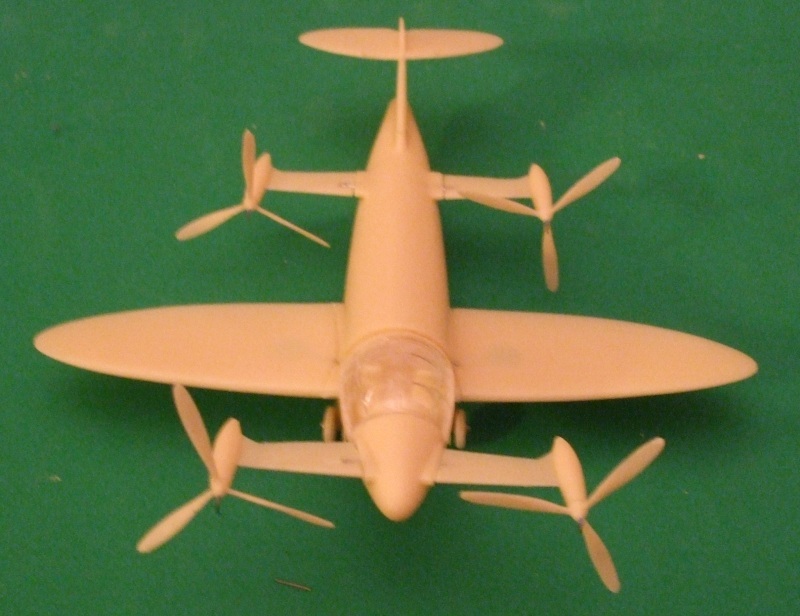 Put a drop of superglue on one side and insert into left or right lift-wing, then opposite, making sure both rotate in a synchronized fashion. 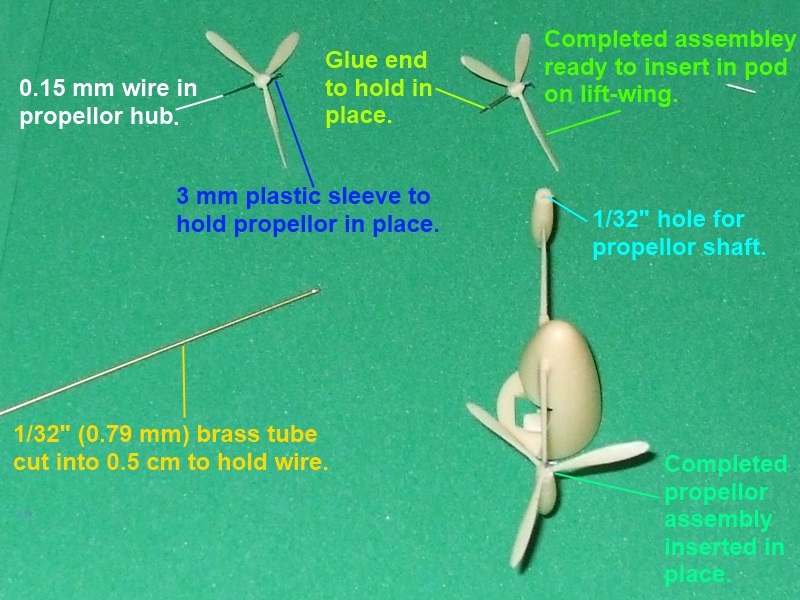 Next drill take your 1/32" wire and run it through each propellor. 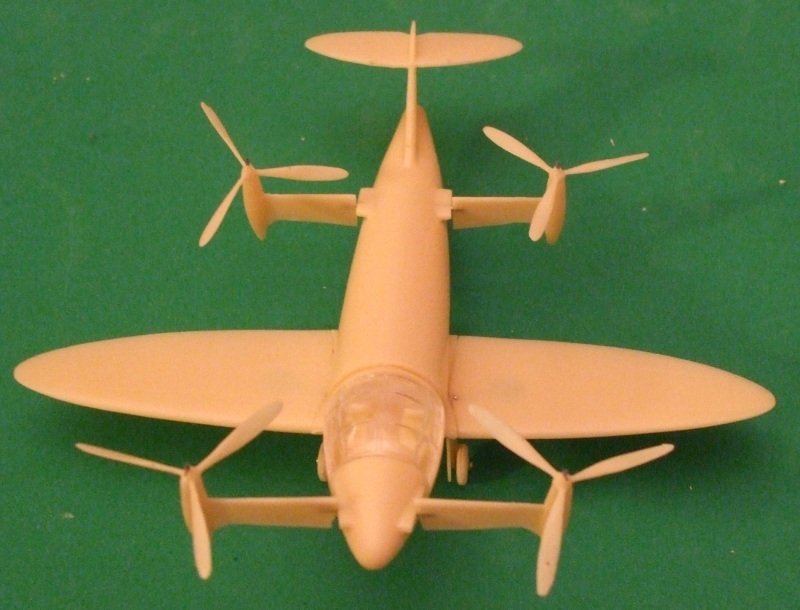 Put a drop of superglue on and insert into the propellor pod. This will provide rotating propellors. Once completed, return to the nose section. Glue and insert the cockpit floor, followed by the control stick on each side and then the seats. Once in place, insert the cockpit into the fuselage matching the notch in the top of the ring with a minimal amount of glue. Let dry. Moving on to the main wings, line pins up with the holes at each wing root an attach with glue. Make sure wings are lined up horizontally at a very slight angle. Remember, Spitfires typically had their wings up about 3°-5° on each side. Once in place, turn the assembly over and locate the metal landing gear. For the landing gear make sure the gear doors are aligned for each side as per the photographs and the way the doors fit inside of each wheel well. Also be sure that the axels fit snugly through the wheels on each side and into the landing gear legs. Once painted, insert and put a drop of glue to hold in place. When it comes to painting the kit upper surfaces were what was called Bamboo Green and undersurfaces were a light Pearl Grey. 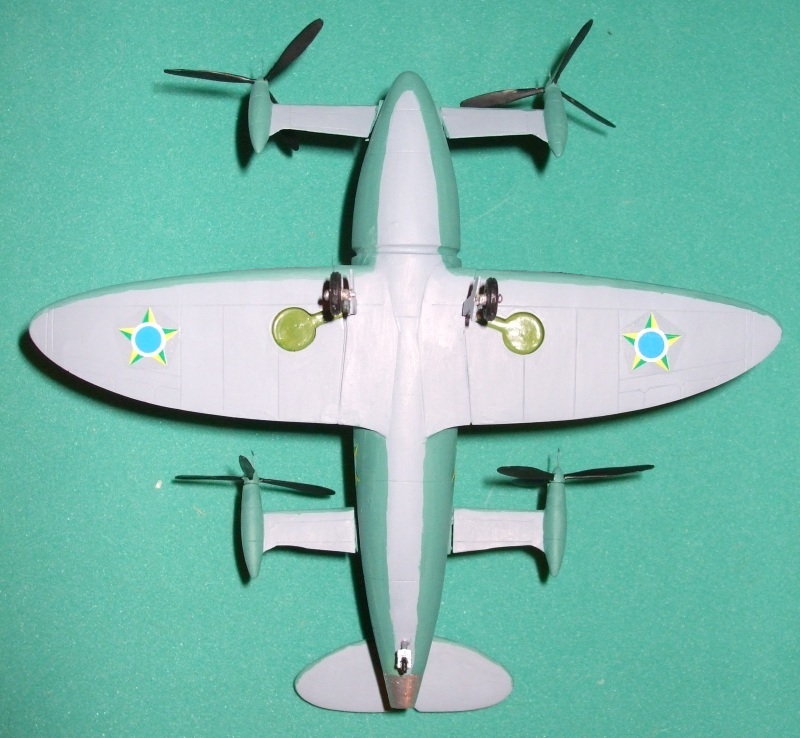 Propellor blades were black, front and back, and the pitch adjustors were the same color as the upper surfaces. For this kit we chose to use POLLY Scale PENN CENTRAL GREEN (F414368), NEW GRAVEL GREY (F414332), ENGINE BLACK (F414290), ATSF SILVER (F414143), TAMIYA COLOR Sky Grey (XF-19) and MODEL MASTER ACRYL Zinc Chromate Green Flat (4852). 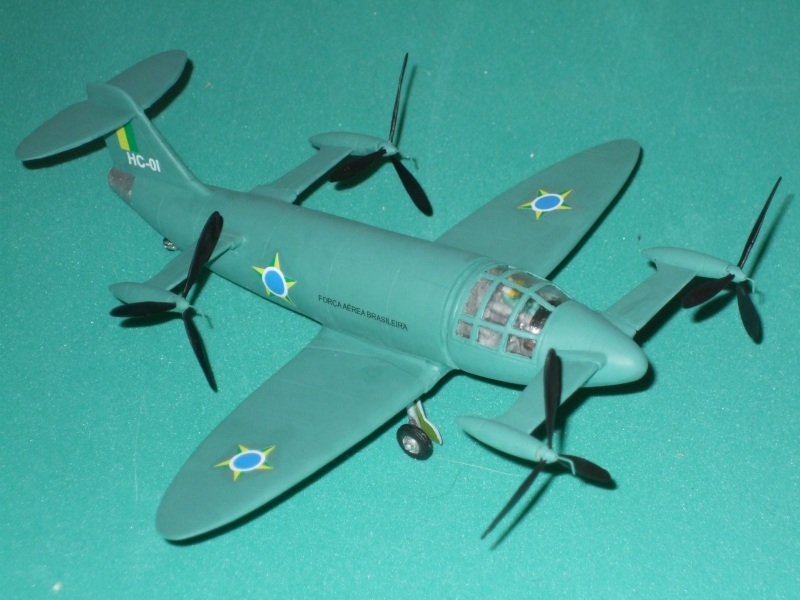 These were the colors that matched exactly with the Brazilian Air Force color schemes, historical references and personal recollection of those that worked on the aircraft. 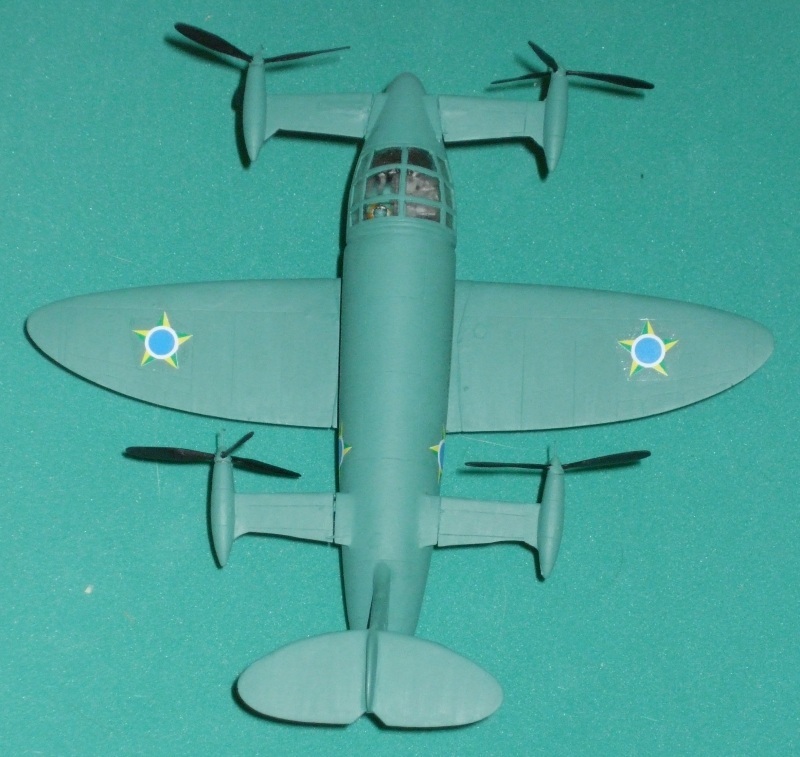 In reality the entire aircraft ended up in Bamboo Green inside and out when set out for storage years later. 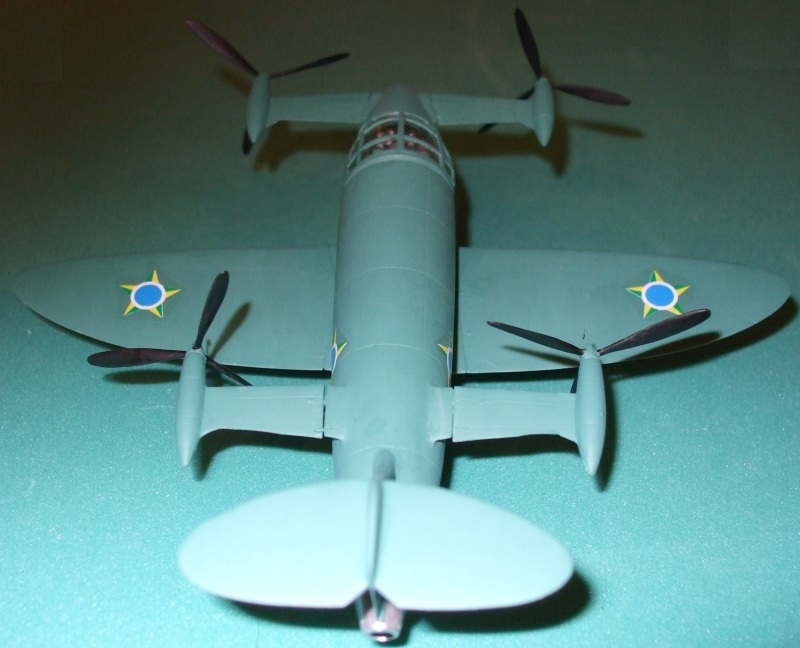 Inside of wheel wells was a light green as applied in the United Kingdom by Supermarine with silver gear legs and hubs with typical black rubber tires. The cockpit interior would be a light grey with black consol and canopy trimmed in Bamboo Green. The pilot would have been in a green flight suit with the yellow life vest and typical goggles, gloves and boots. 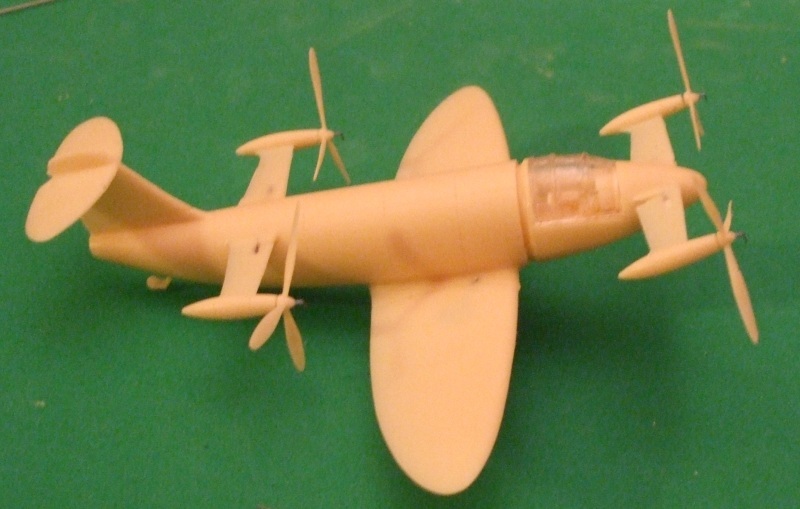 Since this is the version based on the wind-tunnel model powered by the British Armstrong-Siddley ASMD.1 Double-Mamba gas-turbine, the exhaust cone at the end of the fuselage is silver or aluminum. 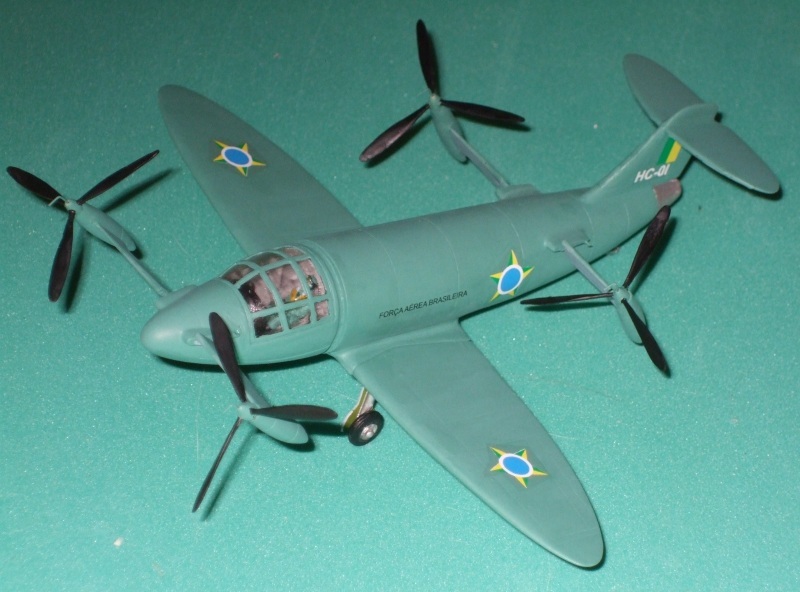 Also note that Brazilian Air Force upper surface colors come over the leading edge of the wings to the underside similar to the air forces of Italy, Spain and a few others. 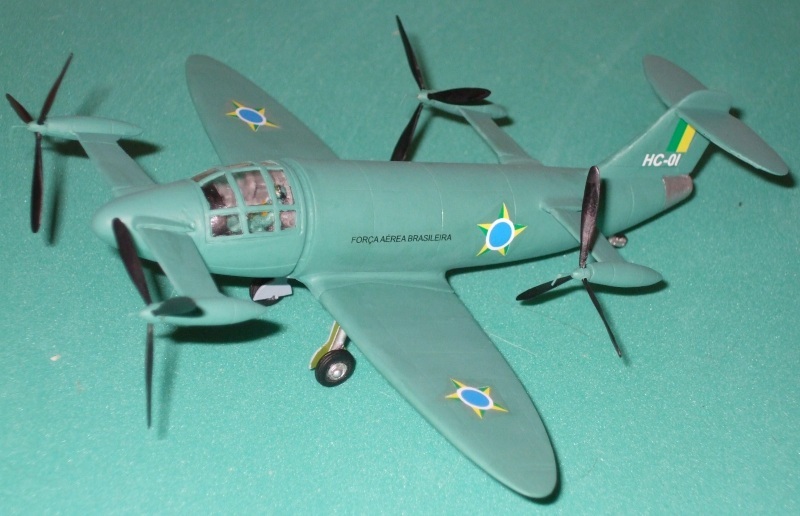 Decal placement is as close to the regimen of the day based on available research for the Brazilian Air Force of the late 1940s to early 1950s. Feel free to complete your kit the way you feel is best! This is our version for the HC-Ia. IRMA will be doing the other two versions, the HC-Ib and HC-II in the near future.